You may remember that back in March I started using milk of magnesia as my new natural deodorant. A couple weeks ago I finally finished up my first bottle of milk of magnesia so I thought I’d give an update on how it’s been working. Jesse has also been using the milk of magnesia since March with similarly successful results. He’s even reported that the protection seems to last for more than one day for him, as he occasionally forgets to apply but still doesn’t notice any odor. The milk of magnesia definitely does not stop you from sweating, so if this is a concern you may want to pursue other options. (Although honestly I’m not sure if there are any natural deodorants that prevent sweating.) I think it’s important for the body to be able to sweat so I’m actually glad that the milk of magnesia only prevents odor without interfering with sweating. Since we only recently finished our first bottle, that means that one twelve ounce bottle lasted the two of us about three months. Given that I paid less than two dollars for that bottle, I’d say that milk of magnesia is an incredibly frugal natural deodorant option! In my last post several commenters mentioned that they also find magnesium oil to be an effective deodorant. 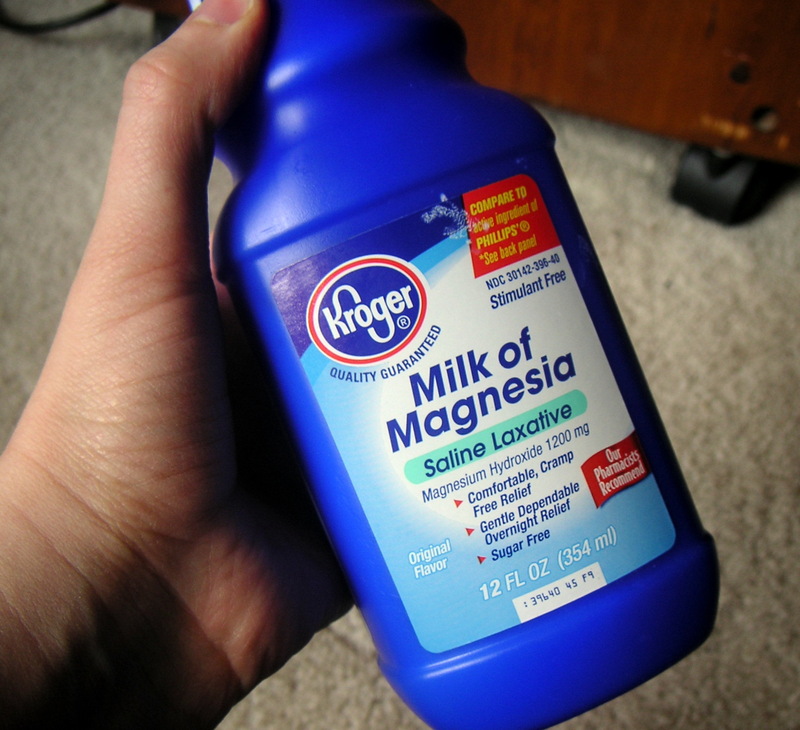 I haven’t tried this myself, but it’s certainly another option to pursue if you aren’t into trying milk of magnesia. This post is part of Fat Tuesday, the Morristribe’s Homesteader Blog Carnival, Freaky Friday, and Fight Back Friday. What’s your natural deodorant of choice? ← Frozen Wild Fish at Costco! Hi Megan, Thanks for the update! I've been thinking about reviewing this idea, and was wondering how it was going. Can you share how you apply it? I put my milk of magnesia in an empty pump bottle (from hand lotion, I believe). Both the bottle and the m. of m. work great! Hi Meghan! In perusing your site, I saw this update on your article I had found, and was just tickled at your results—anytime someone can do the research and testing, that is OKAY with me! I had tried the various baking soda and oil combinations with disappointing results. Wetness under the arms could be greeted with joy, a built-in "misting" agent, if you will, as it naturally helps us with cooling (if we wear open and loose clothing in hot weather, for instance). In fact, there won't be any bad scent if we dress this way (and don't keep arms constantly down and closed in—but you all wouldn't be doing that as you are such active people :) Oils and clays will block the pores somewhat if that were desired, however. Baking soda burned though the idea of odor control with it was a good one, along with various essential oils that are known to keep odor-causing bacteria away and give a pleasant scent. However... From researching PH, potential of hydrogen (acid/alkalinity), I know that odor-causing germs can't live within an alkaline environment, which is why this milk of magnesia (magnesium hydroxide) works. What I don't know, but would like to, is exactly WHICH form of magnesium would be optimum. Maybe there's a chemist out there! I'm thrilled with this discovery right now, though, and again, will get back. I love your work! Yes, it is always great to be able to benefit from someone else's experience/research! That is interesting about the alkaline environment. I hadn't read on explanation of why the milk of magnesia actually works. Sorry! I forgot this little ditty: YES, the EASE at just pouring a bit in your hand and applying can't be emphasized enough—saves so much time. We don't need a roll-on or spray lotion for our facial lotion—fingers are the greatest tools! Though a roll-on is fine for underarms, milk of magnesia right out of the bottle feels better in the hands than lotion—it's not sticky or greasy, and by adding unnecessary ingredients so as to facilitate rolling-on, it makes this simple ingenious idea not as effective and it creates so much more work (not to mention expense! ).I hadn't found another website that mentioned this important little detail! Kudos, Meghan! My 19yr daughter was having an underarm rash and read on her deodorant stick not to apply to broken skin. "What do I do, Mom?" Having just read your experience with Milk of Magnesia, I recommended she try it. She called the next day saying it really worked! A few days later, it was still doing the job much better than her other deodorant ever did. Thanks, Meghan!! Yay! I'm so glad she's having success with it! This is one natural method that I hadn't heard of before - I'll be trying it for sure since it's so simple! I will try MoM. Hope it'll work. I am currently living in Mexico City and have searched high and low for a replacement natural deodorant. Every single one in the grocery stores are full chemical types. I have been doing research online about aluminum in antiperspirants and the FDA does not consider it unsafe. There are links to neurological disorders and you should not use it if you have kidney disease. I also read about MoM that you should not use it if you have kidney disease (this is ingestion, but your skin will absorb it). I am in the belief that it is natural to have your pits wet when you sweat and I prefer not to smell, thus a deodorant is essential. I will be trying MoM as soon as I can get some here in Mexico City and I will report on my experience. Thank you for all the great information you have provided!!!! I'm delighted to see this discussion of MoM as a deodorant. I've been using it for three years ever since I read the late Dr. Roy Mankovitz's book on health. We had a breezy correspondence (he was a genius rocket scientist);I feel he was a bit annoyed with my enthusiasm for the MoM in view of his other astonishing accomplishments. I work out daily and I like to sweat but I don't want to have body odor. I buy the large bottle of original Phillips at Walmart and I apply the liquid with a small cotton circle (Delon). My underarm skin looks very silky and there is no discoloration. I did buy several roll-on MoM from the People's Pharmacy but it annoyed me when there was still product in the bottle but nothing came out so I returned to the simpler way. I love the M o M idea, it works great and I have found a real easy way to apply it with an old roll on deodorant applicator.. Carefully pop out the ball and fill with M o M and pop the ball back in.. I use the same one over and over.. It's perfect.. I've been using MOM for a while now. I used to have bad underarm BO and it's cheaper to get it at the grocery store as well as a travel spray bottle. Pour it in and keep it in your purse or where ever you want for easy access. Make sure to shake it up and just spray on. Let it dry before you put on your shirt, if you are in a hurry use a blow dryer. Lasts all day! I personally like to dehydrate the water out of milk of magnesia in the crock pot, to make it a more creamy consistency. A comment for Jhon - Deodorant prevents odor, Antiperspirant prevents sweating. When you buy what is commonly called "deodorant", it's actually a combo of the two - you just have to turn over the container to see the Aluminum ingredient (that is what blocks the sweating ducts). Most people only sweat when working out or in heat, etc. Others (1-3%) suffer from a condition of excessive sweating, sweating for no reason, all the time, etc - that is a medical condition where Aluminum or Botox is the only solution currently. I make this MOM stuff for other people - they love it, but I suffer from the excessive sweating condition & it doesn't work for me. But thought I would inform you about the differences:). You may want to schedule an appointment with a dermatologist if you think you have "Hyperhidrosis". It works!!! I've been using this for 3 days and I don't smell anything from the pits! haha. I even took a shower today and didn't put on any after and started sweating and I still didn't smell anything! I've had the worst problem with B.O. since my early teens...Yayayayay!!!!!! I've been using MoM for over a year. I love how effective it is. I've actually begun to pour a small amount into a container and mix it with a little cornstarch. To the full bottle I had added several drops of frankincense oil, just for the scent. Just recently though I'd read that lemongrass essential oil can help reduce sweating. So today in hundred degree weather, I applied my MoM/ cornstarch mix with lemongrass oil. I really didn't sweat much at all, and definitely less than usual. I buy milk of magnesia at the dollar store and then pour it into refillable roll on bottles like these http://amzn.to/2iEelSR. It works amazingly and I save a lot of money. It works well.